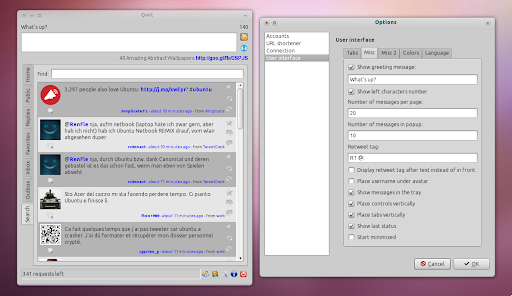 Qwit is a cross-platform (works on Windows and Linux - any desktop environment) Twitter / Identi.ca client written in Qt4. The application was recently updated (currently version 1.1 pre 2) to support OAuth and comes with http-proxy support, customizable interface, Twitpic support, a lot of URL shorteners, multiple accounts support and other features. What's interesting about this Twitter client is that you can customize which tabs refresh automatically and which manually and you can of course also specify the update interval. Also, Qwit integrates well with both Gnome and KDE and can use libnotify, kdialog or Qt notifications. Note: after installing Qwit, don't enter your Twitter username and password - that won't work (it doesn't work with any Twitter client anymore unless it uses SuperTweet). Instead, click the "Authorize" button under "OAuth", then follow the instructions. You can also find Windows packages for the latest Qwit 1.1 pre 2 @ Qwit homepage (not download page!). Or you can compile Qwit yourself. Thanks to Roberto @ LFFL for the .deb files!